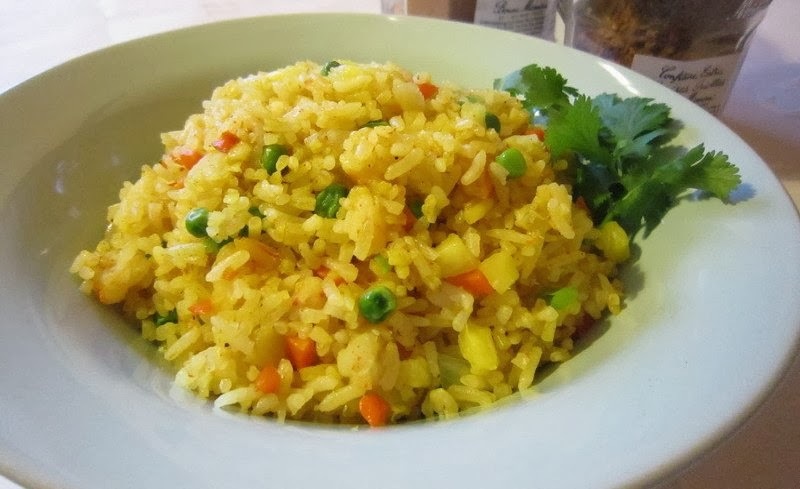 One day my husband was in a mood, and the only thing he wanted to eat for dinner was Nigerian fried rice. I didn’t know how to make it, but I had eaten it before, so I just started to cook, adding things that I thought would create the right results. When I served it to him he was astonished that I could make exactly what he was wanting, without a recipe. So I guess this is legitimate Nigerian fried rice. Add oil to a big frying pan or wok. Let heat on medium high before adding onions. Cook onions until soft. Move onions to the side and fry eggs in the other side, making them small pieces. Add Maggi cube, salt and curry and mix everything together. Add frozen vegetables and fry until thawed and heated. Add rice and continue frying until all the rice is coated with a nice yellow color (you may need to add more oil or curry to accomplish this). Lastly, add the chicken and boiled eggs and serve.